HIGH OUTPUT: 150-lumen(MAX) CREE LED provides intense beam of light up to 600 feet. Features 3 modes means you will be ready for anything that comes to you. POCKET-SIZED: Heavy duty, Compact and Durable with clip design makes these little flashlights perfect for EDC/camping, emergency. LONG-LASTING: Powered by a 14500 rechargeable or a AA battery(not included) and ensures hours of use. RISK-FREE PURCHASE: You get BYBLIGTH 4-pack Mini flashlight, user manual, and our worry-free 18-month warranty and friendly customer service. Why You Need a Flashlight? You never know when you need to rely on a flashlight. If your lights go out, or something happened in an unexpected state, then a flashlight can be a lifesaver. Sometimes, it's not a particular project that demands specific items, but instead a desire to be ready for any job at any time. 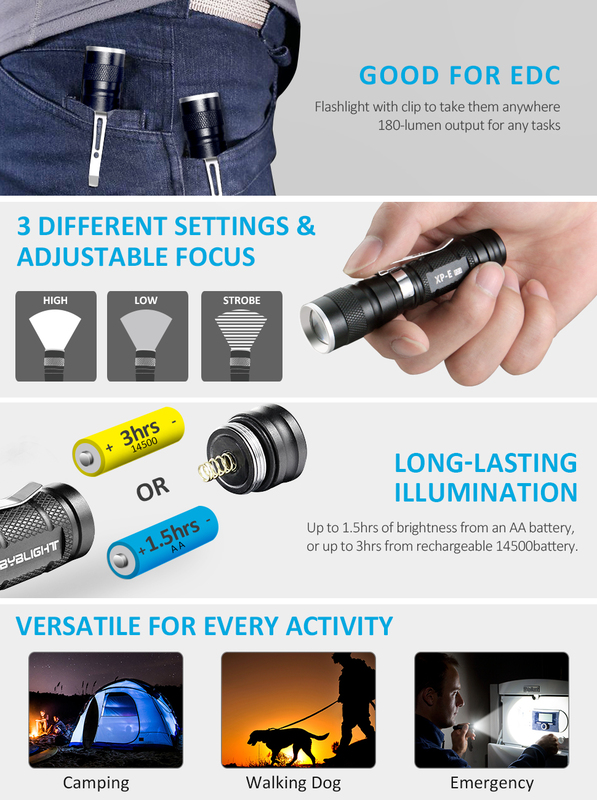 Why BYBLIGHT 4-Pack Mini Flashlight? Affordable price for 4x CREE LED Flashlights and Excellent quality for versatile usage, you can’t beat the deal. 150-lumen, pocket-sized with clip, 3 modes and adjust focus makes it perfect for any requirements at any time and any conditions. High-performance Cree LED chip delivers 50000hrs of intense brightness. 180-lumen(MAX) LED is powered by our advanced technology and prolong the battery’s lifespan. 3 different settings make the mini set essential for all low-light situations. High powerful beam, energy-saving low-beam, and Strobe for emergency. Easily adjustable zoom lens that allows you to broaden or narrow the flashlight beam at will. Compact with clip design for everyday carry and all kind of outdoor activities. Premium aluminum casing resists rust and corrosion. Powered by a 14500 battery or a AA battery, got it easily, Not included. Don't be fooled by its size, the reliable, powerful and durability of the set are typically much higher then what you expected. Add One Pack to Cart Now and make sure you have a trusty helper to hand. Yes, it can be used on rainy days or under humid environment(ordinary waterproof). But our flashlight can't be submerged under water. Can I mount it on my cap and use it as a headlamp? Yes, there's a reversible clip. You can clip it onto the brim of your cap and fasten the flashlight body onto the cap. What type of batteries it use? It can be powered from either one 14500 rechargeable battery or AA battery(battery is not included). You can easily find these type of batteries in shops. We go geo catching alot and it never fails the kids break them! So I wanted a fairly decent priced flashlight for all for of the kids that was not real heavy! I thought these would be kinda cheap (which was fine they are for the kids) but boy was I wrong! Comes in a cool little carrying case with wrist strap. Each flashlight has a clip makes it convenient to carry. Also the flash light has a high, low, and SOS light. You also can adjust the size of the beam by extending the top of the flash light but just sliding it out. These are perfect for the kids but also would be great for any emergency kit. Each flashlight came with a battery all ready in so it was ready to go. These by no means are cheaply made! Highly impressed!